The color on the patterned side of this Obi is very difficult to portray accurately (and Adobe doesn’t help much!) It is a very dark olive green/brown combination. his is a remarkably understated Fukuro Obi in its choice of design. 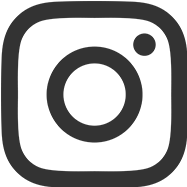 One side of this handwoven Silk Obi is a superb heavy Satin Silk in pure black. The only motif on its entire length is the Master Weaver’s signature and seal used to subtly demonstrate the status of the woman who requisitioned its weaving. Only individuals with high status and wealth would have been able to procure the efforts of a Master Weaver…it is very rare to find the Weaver’s signature so obviously displayed. 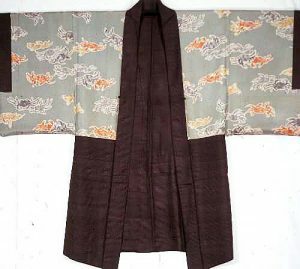 The reverse side of this Fukuro Obi is a harder faced Silk weaving in a dark forest brown that is very sparsely decorated. 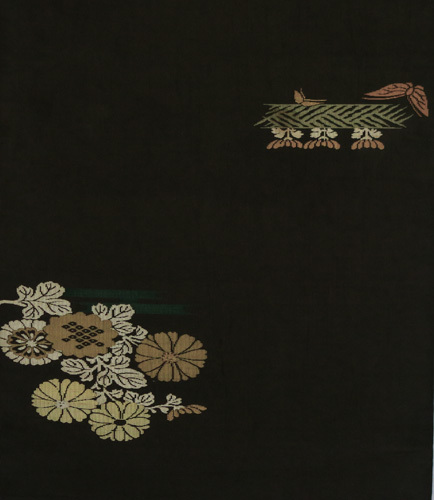 The small motifs are very intriguing in their placement on the length of the Obi and range from stylized flower arrangements to a butterfly/geometric design. The contrast is fascinating and contributes to the difficulty of defining the individual elements. It appears to follow a category called Hosoge, an arrangement based on imaginary multi-petaled species that cannot be identified. It looks familiar, but cannot be completely recognized. It sometimes includes a form of plant or leaves woven within the arrangement, as well as the flowing water. 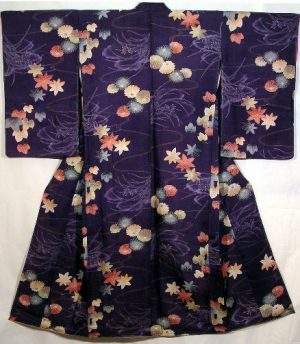 The Butterfly (Cho), flying over the geometrically flow of water and stylized flowers has long been a favorite pattern among the Samurai class which looked to balance its warrior’s life with its more effete love of poetry and literature. 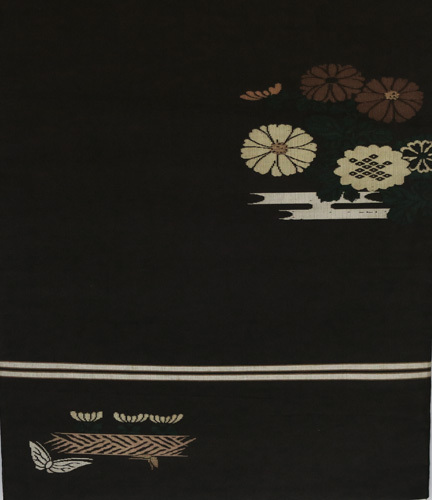 The coloration of this Fukuro Obi is dark black reversible to an equally dark woodland shade. 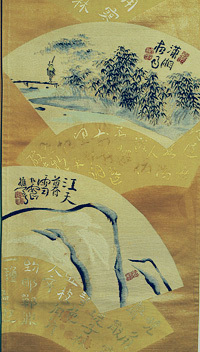 A more subdued tint indicates that this Obi was intended for a married woman who was confined, by decree, to wear colors that did not draw attention. 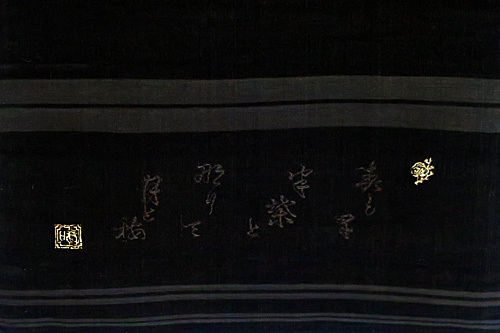 The inclusion of the Master Weaver’s signature points to the high status of this individual. TTAC will personally pack and ship via UPS at company expense within the continental United States. 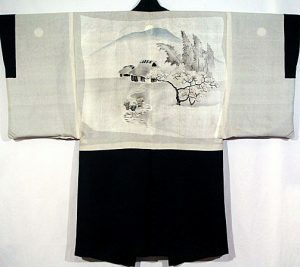 The Fukuro Obi differs from the Maru Obi, the most formal of the Obi, by the fact that seams appear on each side of the Obi, rather than on one side only. This allows the weaver more creativity in terms of the decoration on each side of the Obi. It also allows the Obi to reverse to an entirely different look as the wearer desires. Woven silk in excellent condition. Creates an unusual and dramatic wall hanging, either vertically or horizontally, or an extraordinary table or chest runner.